The first monthly parking spot that comes to you. What they do: Valet Anywhere is the first monthly parking spot that comes to you - they pick up your car, park it, and return it to you wherever you are. It’s automated long term parking for urban car owners. They take care of all the little things that make cars in the city a pain: monthly parking, filling gas, car washes, maintenance, etc., all for less than a traditional monthly parking spot. Why it’s a big deal: Long-term city parking hasn’t changed in decades: suffer the pain of street parking or spend $561 / month to park ten blocks away at the nearest garage. Valet Anywhere has made urban car ownership easy by dropping off your car wherever you might be on Friday at 6pm full of gas and ready for the weekend. Most would pay a premium for that kind of service - Valet Anywhere is cheaper than the local garage. 55% mon/mon growth for nine months is a good start. While $1,300 yearly profit/car bodes well for the future. Valet Anywhere could become the defacto garage for city car owners that spent $4.8 billion on parking last year (US). If all goes well they’ll have a fleet of thousands of cars to monetize in a number of ways - free parking is a great way to attract customers. 1 $228K Nov revenue. $2.75M ARR. 2 21% avg m-o-m growth rate with positive gross margin. 3 3 deals with real-estate builders and mgt companies to sell parking subscription along with luxury condo units. 4 Cheaper than average monthly spot in NYC. 5 $1,300 yearly profit on every car. 6 6 densest US cities spend $4.8 billion on monthly parking. 7 Select investors include: Tusk Ventures, AngelPad, CA Ventures. Founder SmrtGuard (Acq. 2011), SmrtCase, Steath Mode. Formerly at SnapOne, Merril Lynch, and Citibank. Speaks 3 languages. Columbia alum. Founder SmrtGuard (Acq. 2011), Stealth Mode. Sr. PM at SnapOne. Senir Consultant at Accenture. Columbia Engineering alum. Published multiple engineering guides. Founder SmrtGuard (Acq. 2011). Formerly Barclays, Lehman, IBM. Valet Anywhere has solved a problem we all despise: dealing with a car in the city. Unlike their competitors, VA’s model is actually profitable because they’re focused on the ideal customer: urban residents who need parking 365 days / year. This team has already sold one company, now their second is almost profitable after only nine months. Valet Anywhere has grown 55% month/month since February, each car brings in $1,300 profit every year, and they’re still cheaper and more convenient than traditional monthly parking spots. In the U.S. alone car owners spend $4.8 billion every year on inconvenient long term parking — the market is huge. Valet Anywhere has finally made it easy to own a car in the city. They pickup and dropoff wherever you are, clean the car, fill it with gas, handle maintenance all for less than a traditional spot. Valet Anywhere started in the hot space of short term valet (where Luxe just raised $20m). They soon realized the unit economics were terrible — it’s a negative ~200% gross margin business with no clear path to profitability. So this savvy team pivoted early to focus on city residents that pay 365 days a year but only need their cars 1–2 days per week. Now every car earns $1,300 profit in the world’s largest parking market. Once they perfect the experience in New York it will be easy to expand across the US and abroad. We all love cars — they’re not going anywhere and any service that makes car ownership as easy as Uber gets our attention. But it’s the long term vision that excites us. Soon Valet Anywhere will manage thousands of cars that go unused 90% of the week - cars they can rent like Zipcar or out to Uber drivers. These guys will take a cut of every portion of the urban car market: storage, gas, cleaning, maintenance, and rentals. Now they just need some money to own New York before raising a Series A to expand worldwide. Love it! They take excellent care of my V12 Vanquish. Would recommend to my closest friends. Good companies have an option to choose their investors. General Manager of Uber NY. Investor and Advisor to Valet Anywhere, Pager, Tusk Ventures, and Breather. #1 U.S. Accelerator (Seed Accelerator Rankings 2015). AngelPad is a seed-stage accelerator program based in San Francisco and New York. Helping startups navigate the political, regulatory, and media hurdles that come with reshaping entrenched industries. Early stage VC into mobile and consumer technology in Asia and United States. Founder of AngelPad, Ex-Google Product Manager, Startup Advisor, Angel Investor. Bringing the ruckus to angel investing. VC scout/leading feeder angel. Former tech i-banker, corp dev, CFO, Perot Systems. It’s Friday morning and a customer plans to drive the beach for the weekend after work. In the old scenario they would hail a cab at 6pm, wait in traffic all the way to their garage only to find their car almost empty on gas. With Valet Anywhere, they schedule a drop off via the app and VA arrivesin-front of their office at 6pm with their car freshly washed and full of gas. At the end of the weekend they drive straight to their apartment where a Valet Anywhere driver is waiting to take the car off their hands. Valet Anywhere can bring a car directly to the customer in as little as 30 minutes. 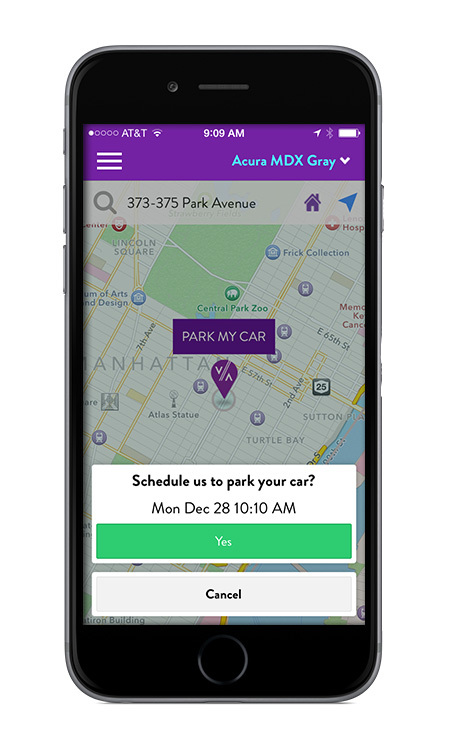 Customers schedule a valet to pick up their car anywhere in the city at any time. Whether pick or drop-off, Valet Anywhere comes right to the door step. With a secure hand-off code, drivers hand over their keys with confidence. Valet Anywhere fuels, washes, and parks the car in a secure garage. Customers just get in and drive. Watch their promo video and the how to guide for new call agents. Competitors focused on short term parking like Luxe are far from profitable. Valet Anywhere’s long term parking model ensures low churn, high customer lifetime value, and $1,300 in profit per customer per year. Can you walk us through a use case? Most of our customers live in Manhattan and park their cars on a monthly basis with Valet Anywhere. It’s Friday morning and a customer plans to drive the beach for the weekend after work. In the old scenario they would hail a cab at 6pm, wait in traffic all the way to their garage only to find their car almost empty on gas. With Valet Anywhere they schedule a drop off via the app and we arrive in front of their office at 6pm with their car freshly washed and full of gas. At the end of the weekend they drive straight to their apartment where a Valet Anywhere driver is waiting to take the car off their hands. We’re available 24/7 and can bring a car directly to the customer in as little as 30 min. How does VA compare to the traditional solution of parking in a neighborhood lot? Our customers prefer Valet Anywhere for the convenience - their garage is wherever they need it to be. On top of that necessities like gas stations, car washes, and mechanics are being replaced in big cities by apartments and office buildings. There are only 6 gas stations below 96th street in Manhattan serving 200,000 cars. 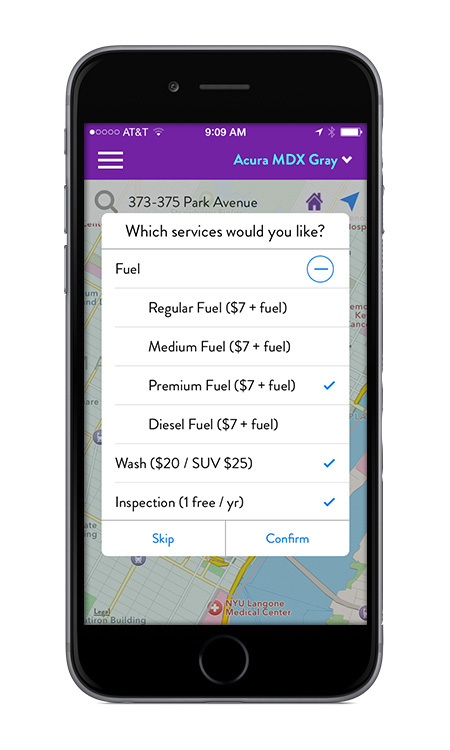 With Valet Anywhere customers don’t have to deal with gassing up or changing their oil. We handle everything and deliver their car wherever they need it. How do you compare in price to traditional garages? Manhattan’s average price for parking is $425 per month. We’re actually less than that and provide many more services. Our base storage plan is $279 per month which gets customers a reserved spot in one of our garages. Our premium package, preferred by 98% of our customers, is $399 per month. We also have a bespoke plan for $1,000 which includes the highest level of service. It’s really a no-brainer and our traction shows it. Who are your customers and what does the initial market look like? Our customers are the wealthiest New Yorkers. A car is a nice to have in such an expensive dense city. There are ~6 cities in the US with the required density to support Valet Anywhere. Market size in the U.S. is ~$4.8 billion dollars. New Yorkers alone spend $1.3 billion every year on long term parking. There are also dozens of cities abroad what would be perfect for Valet Anywhere. Why long term parking and not on demand parking like Luxe? It’s true we can’t give users access to their cars instantaneously. We used to think this was an issue, but the markets we’ll cater to like NYC, Boston, London are very dense cities where people own a car not because they need it everyday but for the freedom of escaping the city. Our previous app catered to on-demand customers like Luxe, but the customers wouldn't stick. Only 9.8% of Manhattan commuters drive themselves, and only 2% drive every single day. It was a poor business. The unknowns were too large and the cost of customer acquisition not worth it. Our new model comes with much more consistent customers that need a place to store their car 365 days a year. Every car owner in any dense city is a potential customer and they’ll pay us every single day. Specifically, how does your business compare to the Luxe model? As I mentioned, we used to run an on demand service like Luxe but pivoted. We learned it’s a negative ~200% gross margin business. For instance they might charge $15 per day in NYC or San Francisco. But it costs Luxe $32.50 to earn that $15. Pick up and drop off takes a driver at least 30 min each way plus the actual cost of parking in a central city location. On top of these costs add marketing, first time coupons, insurance, and a high churn customer. I don’t see how they’ll ever make any money. We’re different because our customers don’t need their cars every single day. They use their cars on weekends, for holidays, or the occasional midweek jaunt. Which means we can afford to park the cars outside downtown where parking is much more affordable. We’re also able to predict demand and adjust the number of drivers accordingly. Because of this our unit economics are 52% and we’re already gross-margin positive. It’s a vastly different business. We make money, Luxe loses it at double the rate they bring it in. So what’s the end game for a service like Luxe? Everyone has their own game, we just realized the Luxe model wasn’t for us. In the short term they may believe there’s an upsell opportunity. But their suburban tourists and commuters don’t need better access to gas, they probably don’t really need a car wash. In the long term Luxe may have a chance if they hit some huge critical mass. To do so, they’ll need a critical mass of demand so drivers are constantly working and they have enough leverage to negotiate rock bottom parking prices or buy their own city center parking structures. This is a long way off, if possible at all. We’re expanding slower than Luxe. First we need to ensure the business model is actually profitable and the user experience is perfect. Then we can easily ramp up fundraising and expand city by city with a model that works. How much do you pay for customers? Our cost of customer acquisition is currently ~$200. We make that back in 6-8 weeks and our lifetime customer value is ~$1,300 profit per year. We know all we have to do is turn on ad spend and immediately we’ll start onboarding profitable customers. How many customers have churned? 7.4% of all customers have churned since we launched. Why do you think those people are churning? 7.4% churn is well above an acceptable standard. Thankfully most customers who left came to us via an ill conceived daily deal acquisition strategy we had early in the summer. Groupon returned the worst customers, many of which were students living in the city for a couple months before school started again. If we account for these temporary customers, our churn is closer to 4%. All we can do is continue to improve the product, lower car delivery times, and provide as much value as possible to our customers. How are you reaching these customers? Traditional channels like Facebook, Google, etc., work but are expensive compared with more creative tactics. SpotHero is like OpenTable for parking and they’ve been a great affiliate channel for new customers. Direct mail has worked surprisingly well. Recently we started street marketing. In New York drivers will sit in their cars as the street cleaners go by and then repark. We run down the street and convert dozens every day to our basic $279 plan. How fast have you grown since the pivot? Compound monthly growth has been 55% since month-over-month since our pivot in February. Tell us more about your decision to expand more slowly than competitors? New York is the biggest market for parking. We’re focused 100% on this market because if we win here we win everywhere. Every dollar we spend in New York is predictable - we know exactly how much we’ll make in return. In other cities like Boston and Philly we’re less certain. So we’d rather spend all our resources ensuring the biggest market is ours. Then we can expand to other cities. Even Luxe has thought about long term parking, but they failed in a few experiments. Their model works for fast growth - it’s a cool business that makes customers feel cool. Who doesn’t want a valet to just show up when they arrive? But they’re spread thin across all these different cities and even though they’ve raised a ton of money, but they’re spending it just as fast. I predict their burn rate is 15x ours. They’re focused on the long term. To get there everything must align perfectly and a bunch of money isn’t the solution - look at Homejoy. We’re playing our own playbook. I don’t think it’s a winner take all in a parking market and if it was we still wouldn’t follow the Luxe strategy. Luxe and Zirx are after the daily market, we’re focused on the long term market. Anyone who wants to jump into long term has a ways to go to catch us. Do you have any plans to utilize the cars that sit unused in your garage 90% of the week? We’ll be sitting on a huge inventory of vehicles for 90% of drivable hours every week and we’d love to offer a peer-to-peer carsharing service on behalf of our customers. Think Zipcar or Getaround only better. We have thousands of cars on hand, we already have the software infrastructure to deliver and pickup cars to customers anywhere. We have systems in place to gas and wash the cars. All we need are customers willing to lend their cars. They’ll earn free monthly parking plus a profit. For owners who only need their cars one day a week, this seems like no brainer. Plus once we can say “free parking for all” we’ll have no trouble finding customers. This opportunity is huge and we can’t wait to explore it after we’ve nailed our first product. Tell us about the team. Who are you guys? My cofounder Lawrence and I met at Columbia University while he was studying Computer Engineering. Dante is our third founder and former mentor of mine at Lehman Brothers. Together, we’ve written and published several books for Blackberry developers: Blackberry for Dummies and Blackberry Programming. Valet Anywhere is our second company as a founding team. Our first start up was a mobile security company, essentially “Find My iPhone” for Blackberry and Android before the iPhone had its own feature. We bootstrapped the company and sold it for cash before Blackberry took a nosedive. We’ve known each other a long time. We work well together. What milestones do you need to hit before your next round of fundraising? This current round is really a small bridge round to get us to profitability. Once we own New York as a profitable company we’ll raise a larger round and replicate the business in dense cities around the country and the world. How do you hire drivers? Ensure they’re not a liability? Are they 1099 or W-2? We’ve developed a honed process after hiring 75 drivers in New York. The interview includes involved logic and mock problem solving that they may encounter while out on the street. We vett for people skills to ensure they can actually interface with customers. Finally there’s a road test with a manual transmission car. If a candidate is hired we put them through extensive shadow training before they’re released on their own. Every month we reassess each driver to ensure they’re not complacent. All our drivers are hired as 1099 contract employees. Once they prove performance and trustworthiness we bring them on full-time as W-2 employees. The difference in cost is negligible for us because we still provide workers comp for all our employees regardless of status. What else do you need to solve for this to really be huge? Like any business we have several challenges. Manhattan is the densest city in the US, so ensuring our margins remain profitable as we expand to Brooklyn and other cities will be a challenge. Next it’s crafting a world class team to replicate a beautiful product as we expand. Those two things are top of mind - supply and team evolution. Valet Anywhere is conducting a Regulation D offering via Wefunder Advisors LLC. CRD Number: #167803. Parking is more than an inconvenience — it’s a $25 billion dollar market in the U.S. alone, and with supply dwindling new solutions are necessary. Drivers in New York spend an average of half an hour searching for a spot (a popular method includes George Constanza's expanding concentric circles), which the makers of a new app say prompted them to find a solution. Parking in a new city can be nightmarish, especially if that city's a major metropolitan area with garages that are full, expensive, or both. Valet Anywhere looks to solve the problem of finding a place to park in Manhattan by supplying users with valets, well, anywhere. 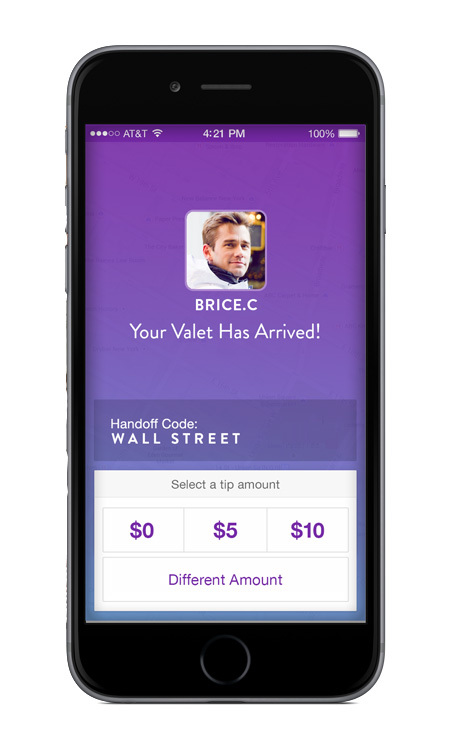 You ring them up from your smartphone when you need a spot and a trained and vetted valet in a purple shirt – the ones with those suspenders drawn on them – will show up and park for you. When you’re done, ring them up again and you get your car back. ValetAnywhere co-founder Robert Kao on the company and its valet app. Valet Anywhere’s mobile app allows users to order valet service “on-demand.” A valet shows up to take and park the user’s car within minutes, and later, delivers the car back, so it’s waiting when they need to leave. The service is being tested at airports and in New York City.